Welcome emails set the tone for your email relationship. They determine how likely a contact is to open a second email, and a third. The welcome email is like a first date. Everything which comes after hinges on it, so you should probably take a shower. Send immediately: Your new subscriber/signup/customer is engaged with your brand. By subscribing or purchasing or signing up they’ve essentially said something to you. Don’t be slow in responding. Generate value immediately: Bring flowers. Make a reservation. Wear a tie. Do something that immediately tells your new subscriber that you’re bringing value to this relationship right off the bat. Personalize where possible: You may only have an email address, but if you have more, use it. Merge tags aren’t exactly the newest thing out there, but they’ve still shown to have, on average, improve email click through rate by 50.33%. Keep it simple: Keep it short for mobile readers and people who don’t have a lot of time on their hands (so… everybody). Keep your welcome email straightforward and use your follow-up drip emails to deliver more value. Make a good, and reliable, first impression: Are you going with a highly-designed template or as personalized as possible? Whatever you do, stick with it for the rest of your drip emails. Edit heavily, make sure your images show and your CSS doesn’t break on different email clients. Because this is a resource for lead nurturing, we’ll be exclusively taking a look at free trial welcome emails. Contrasting, large, central CTA with “Jump In” – that’s copy which is appealing and makes you want to click it on top of a very visible and apparent button. This email doesn’t beat around its focus point. Merge tag personalization of first name only (we gave them both first and last) has been shown to improve email click through rates by 50.33%. Immediately providing value in the form of a “Guide to 7 Things to try in Quip” shows recipient how to get the most out of their trial. Lets the recipient know they’ll be receiving a few more emails in the coming days. This means recipients won’t be blindsided by emails and will more readily anticipate/accept seeing them in their inbox. “Questions? 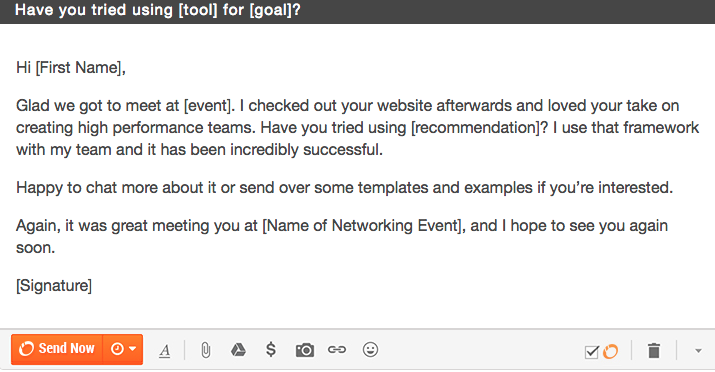 Just reply…” is a great way to start a conversation, even if your welcome email is templated. Just be sure you’re actually monitoring those responses. 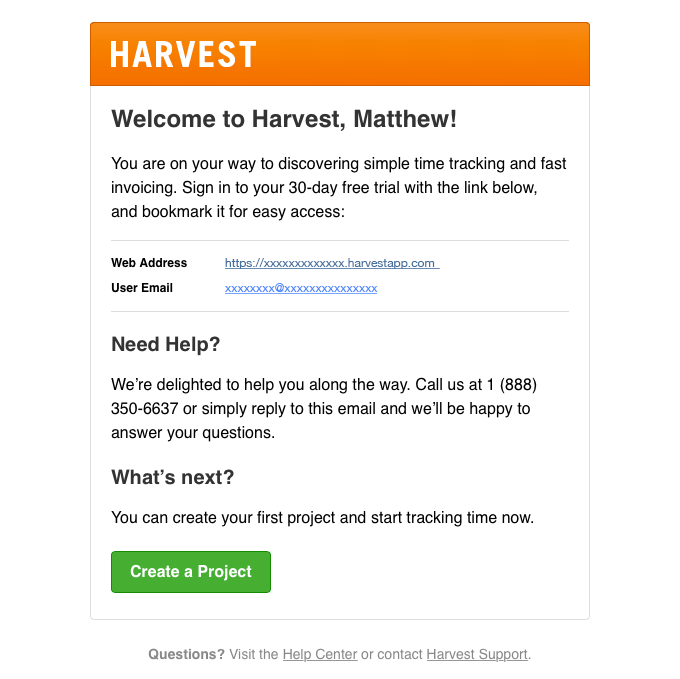 The “What’s Next?” section makes it clear what Harvest wants recipients to do, and the large, contrasting CTA button makes it easy. Structured almost like a landing page (and this is a good thing): headline with value proposition, subheadline which expands on the headline, “hero” image showing the dashboard, easily skimmable bullet-points (not paragraph) and a contrasting CTA. this is an optimized email. Giving new free triallers a three-point to-do list is an excellent way to get them using the platform and finding value. More things to do and they’ll be overwhelmed, fewer and they won’t see the value. Intriguing language (in this case “celebrate with unicorns (they’re friendly)”) encourages recipients to find out more/what they’re talking about. Sends them back to the site to solve the mystery. 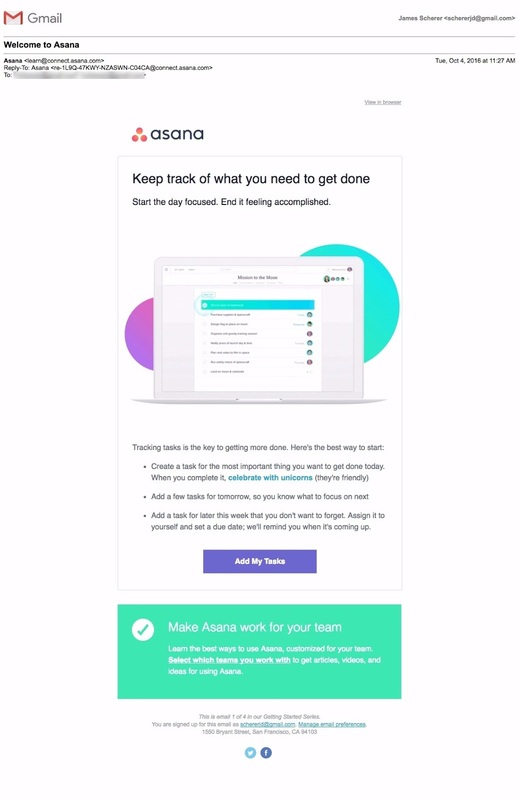 “Make Asana work for your team” is actually a secondary segmentation CTA, prompting free triallers to “select which teams [they] work with” – allowing Asana to create email drip and onboarding campaigns which will resonate better. Non-templated email approach from the co-founder works for businesses trying to get feedback from new signups. Asking a question gets the conversation started. A conversation means a one-on-one connection which massively reduces churn. Super simple and to-the-point. No beating around the bush with expansive thanks or a bullet-point list of what the recipient can get out of BuzzSumo – makes it feel more personal. To all intents and purposes, there’s nothing in this email which indicates it’s anything other than a legitimately-sent, personal email from James Blackwell. This is the goal, and if you aren’t 100% you can do this, go with a templated version. A limited-time discount code is an excellent way to get your new signups or free-triallers onto your website or into your platform immediately – showing them how easy it is to use or (in the case of an ecommerce company) how awesome your products are. The email ‘navigation bar’ is also a very useful way to drive people back to your site. If you can’t provide value in-client, then get people to your site where you can. Excellent visuals here with the four beautiful and high-res fruity drinks. Nice CTA “Shop then Sip” is unique, large and very visible. Upon signup, this email also prompts a secondary conversion “socialize with us” – and gives recipients six options to do so. Secondary CTA “Update your Profile” prompts signups to provide more lead information, allowing True Citrus to market more effectively. Making it super easy to back out takes away any pressure the new signup might feel. Knowing you can easily cancel might actually reduce the chance of it being done. Value-add of a guide to “help you get brewing” (on top of the free coffee) makes this a positive relationship to be in. The navigation options at the bottom help email recipients get back to the website and get the information they want, if they want it. Your early-stage leads are those who have downloaded an educational ebook or registered for an educational webinar. In other words, an early-stage lead is someone who knows your business exists, but only as a resource – not yet a solution to their pain point. But, just like a welcome email is your first date, the early-stage drip email campaign is your next few dates. You want to charm your new leads by providing value and assistance in a friendly, professional way. And then, only after taking them to a nice restaurant, charming them with your witty blog articles and giving them your coat when it got cold – should you lean in for the goodnight kiss. The best way to charm your early-stage leads is with a “Pull and Push” strategy of 3-1. Send three templated emails with educational articles (“Pull” content) – professional, clean, simple and valuable. Send one less-templated promotional email (“Push”). Test if a completely personal-looking email performs better for your Push emails than a template. Optional +1: If you don’t get a response from your non-templated Push email, an option is to send a follow-up “buried email” prompt a couple days after. Shopify is excellent at walking the line between “educational’ case study and “case study’ case study. Here they offer an article which breaks down exactly how an entrepreneur like the recipient built a fashion brand (with Shopify) which now drives $1,500 profit/day. This is the exact type of content their leads want: no-nonsense, how-to guides but with a bit of a case study flavor. The header image here of Shilpi Yadav functions in the same way a customer testimonial does – eliciting trust by showing recipients someone normal, like them. The small CTA at the top right “Start your free trial” is the clue here towards the fact that this is a lead nurturing email, as it’s clearly targeting leads who aren’t currently free triallers or users. Mailchimp is the king of email marketing, so it’s no surprise this Pull email is just about the coolest thing we’ve ever seen. Not only have they teamed up with Facebook, Google, Twitter, Shopify and others, but the visuals here (Mailchimp socks, seriously!?) are excellent and grab the eye. The large and festive headline immediately communicates the subject of their email. Having multiple CTAs – one in-line and one in a CTA button – is best practice, so long as they send recipients to the same page. Segmentation: There is no point in sending this email to anyone not marketing (in some respect at least) an agency. But, to an agency lead, this is super relevant and an excellent educational resource. The design is, again, very like a landing page. Ideally this email will correspond with a landing page on the website with the same color scheme, image and design elements. This will improve conversion rates on that page. When promoting a webinar, you need to immediately communicate three things: the subject, the date and time, and the host. Typecast does this excellently here as well as really effectively grabbing the eye with a large image. The central CTA allows recipients to click through easily before reading the paragraph below, and the bottom CTA allows recipients to click through easily after. Every webinar promotion should also feature a bullet-point list of what’s going to be covered – usually with a “you’ll learn about” intro. The “Have questions? Just reply…” copy at the bottom, with a headshot of the Typecast email sender is a really nice touch – adding some personality to the automated mailout and improving the chance of a response. This email uses contrasting colors really effectively, both to emphasize sections of their email copy (“getting married,” “early access list,” and “Groom’s Guide”) and the CTA at the bottom. The email-gated guide they’re promoting isn’t actually out yet, but creating an early-access list effectively segments their contacts into what a SaaS/B2B company would call “hot leads” – people who are getting married soon and are very interested in getting it right. The large, high-res image also reminds recipients of how good The Black Tux’ products look, which is never a bad idea for ecommerce. Acme Realty had a difficulty turning their considerable PPC and social advertising traffic into leads. People would arrive on their site, remain and find value in the content they found there, but wouldn’t commit to a viewing or request more information. By introducing Wishpond’s property-specific landing pages and a scroll popup, however, they were able to increase their site’s traffic-lead conversion rate by 212% within a single week. We wrote up the Acme Realty case study and produced a simple PDF <here>. It gives more details about their target market, objectives, time frame and cost associated with their winning strategy. This Push email requires you to know your lead’s industry (which should be easy if you ask for it in a form or ask for their company name and do a little digging). Focusing on the industries of your leads allows you to find and collect industry-specific case studies, which are far more persuasive when nurturing from early to late stage. Hint at the extended value in the case study (“gives more details about…”), otherwise the results are pretty much all there is. A beautiful email which is nothing but image, showcasing Herman Miller’s Eames design chair and the limited edition tote they’re giving away. The color scheme of the logo, headlines, CTA buttons and the chair all match perfectly – making this a professional and appealing push email. Whenever your ecommerce company is having a sale, put time and energy into creating a website landing page and corresponding mailout to your leads and customers which features the products front and center. The “pre-sale bonus” is a great idea, particularly as an incentivized lead generation strategy. You can get more lead information out of leads and create a segment of your most enthusiastic contacts. This is an awesome way to showcase your product’s capabilities – giving leads a checklist of all the cool stuff they can do with relevant links to blog content, an FAQ, or product-specific landing pages. Showcasing overwhelming platform value is an aggressive strategy for early-stage lead nurturing, but it might just work – because it is overwhelming. The use of the holidays is also a best practice. When creating an optimized email campaign, tap into what recipients are thinking – same as you would for a blog article or social media post. Any time you see a course, know you’re going from Pull to Push content. The first, second and third steps should be solely educational, but as you get through it you should expect to see screenshots from the platform, then a step-by-step walkthrough for completing a strategy within the platform, than an outright signup prompt. And it works. Courses like “how to start your own business” are an excellent way to educate leads not just about how they can achieve their goals, but about how your business can help them do so. 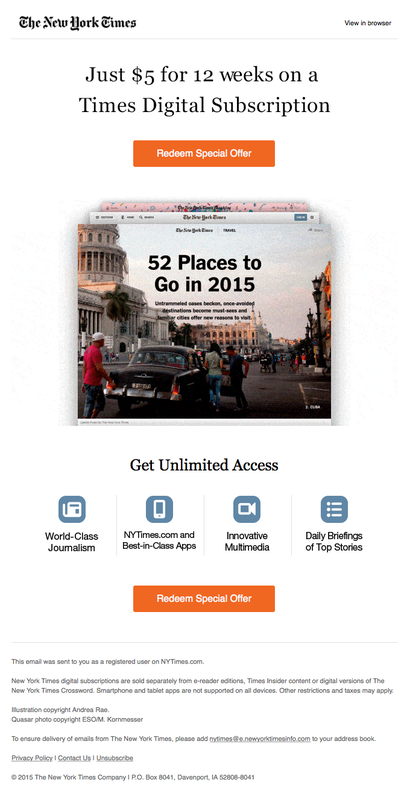 This email is also effective because it features the Push content, but includes Pull content down below. This is a subtler approach. A promotion or discount on your platform is one of the best ways to turn early-stage leads into late-stage leads. You know your recipients are interested, and might just need that extra push which a discount gives them. This email from the New York Times is super simple and clean. A lot of whitespace, large text, an intriguing image, two high-contrast CTA buttons and a four-point, icon-led benefit list at the bottom combine to create a very landing-page-esque email clearly optimized for conversion. In late-stage lead nurturing, we keep the 3-1 ratio which got us here. But there the similarity stops. Firstly, instead of purely educational blog articles, webinars, podcasts or reports, we’re sending content relate directly to our product – what differentiates us from competitors, what our strengths our, and how businesses similar to those of our leads have found success. Secondly, the drip campaign our leads are placed into is based on what made them a late-stage lead (the trigger for late-stage lead segmentation). These four late-stage drip email campaign examples will be prefaced by the triggers which placed our leads. If the trigger for your lead being placed into a late-stage drip email campaign was downloading a whitepaper, you’d send four follow-up emails. But I did want to reach out and ask if you have any questions or wanted to talk about any of the points you saw there? Since that whitepaper was released we’ve actually lowered our pricing/lead for businesses looking to create more than 10 landing pages in their first month. Would that apply to you? I’d love to get you on a call to talk about what you’re looking to achieve with your lead generation strategy and what your timeframe is. Let me know if you there’s a time which works for you this week! This is about as real-sounding as an automated email can be. It’s particularly effective as it gives a reason for the sender knowing the recipient downloaded the whitepaper – a reason which would make sense to the marketing target market. The tone is casual but friendly – low pressure but clear about what’s wanted. The change to the pricing structure is something which would, genuinely, warrant a follow-up email – so the “reason” for reaching out makes sense. It’s particularly effective as it’s related to a price drop, which makes the product more appealing. If the trigger for your lead being placed into a late-stage drip email campaign was watching a product-related webinar, you’d send four follow-up emails. This is clearly a templated email, but that works with the offer of a discount. If your late-stage lead nurturing email’s CTA is to “jump on a call” or “arrange a time to chat” then you should go with a non-templated, personal email. 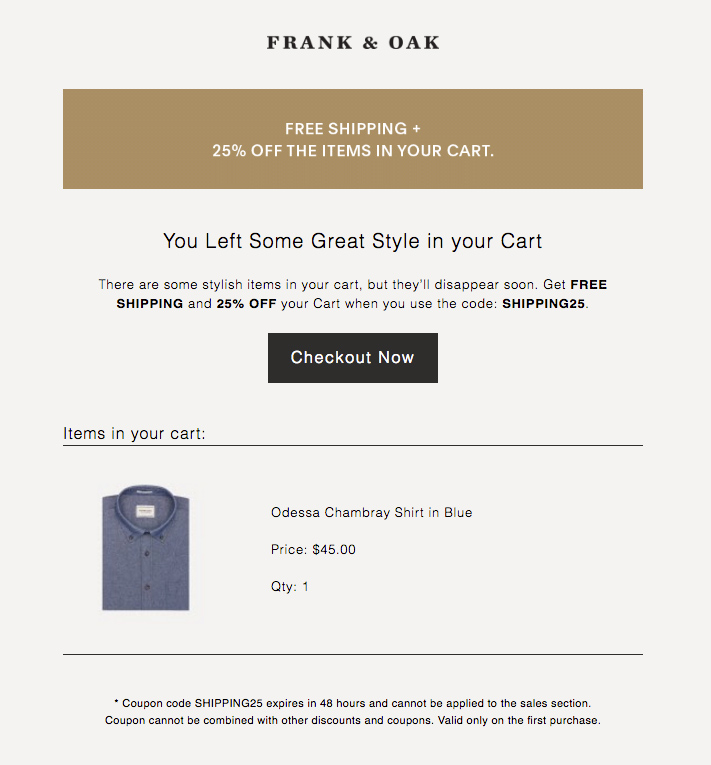 If you’re offering a campaign-specific discount, then a templated email makes sense. At this stage (post product-related webinar) your lead will respond better to a free trial free demo or a discounted monthly plan than a pitch for a year’s subscription. Also notice that the offer is specific to the subject of the webinar. Don’t confuse your attendees by, at this point, throwing in a bunch of other value propositions. Stick with what they know and offer something related to it. If the trigger for your lead being placed into a late-stage drip email campaign was viewing website pricing pages multiple times in a set period, you’d send a couple follow-up emails. Just wanted to reach out and ask if you had any questions about our platform? I’m available between 2:30 and 4:00 PST this afternoon if so. Just reply to this email with a number and the best time to call and I’ll be in touch. If someone has visited your pricing page multiple times, don’t beat around the bush. Make it super easy for them to ask any questions they haven’t yet asked. This email is personalized, but automatic (the “available times” can be done with marketing automation, merge tags and and integration with your CRM platform). But it also leaves engagement in the hands of the recipient and doesn’t make it obvious that it was triggered by lead activity. It’s more of a “Hey I’m here if you need anything, but no pressure,” – kind of email. If you did “Hey I saw you were on our pricing page, do you want to buy soon?” email it wouldn’t go over so well. If the trigger for your lead being placed into a late-stage drip email campaign was viewing website product pages multiple times in a set period, you’d send a couple follow-up emails directly related to the product page they viewed. I’ve heard from many other companies that they struggle to determine if they’re getting the most out of the traffic they drive to their website. Is this an issue at AcmeShoes.com? Recently, we used our own Wishpond exit and scroll popups to increase the return we were getting from Google Adwords by about 23%. 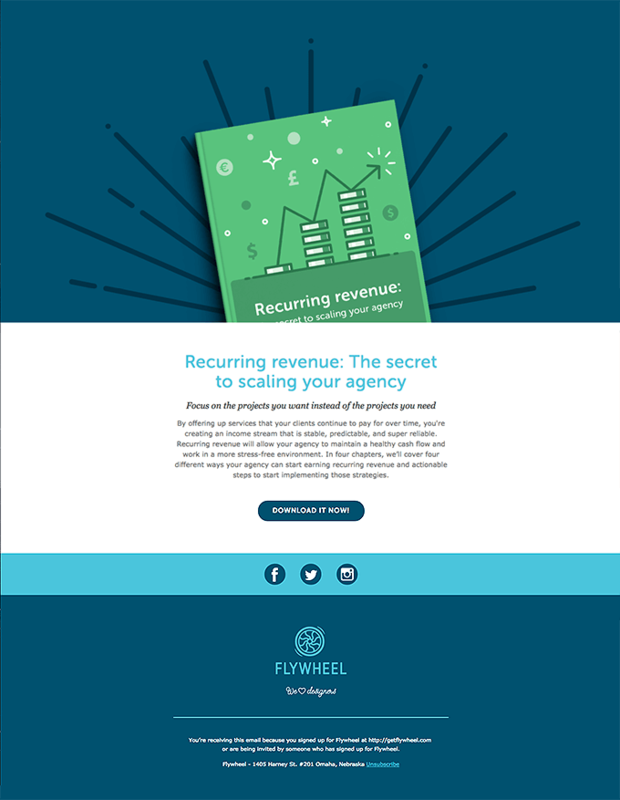 We added them to our campaign-specific landing pages and it’s resulted in almost $20,000 in improved revenue this month alone. 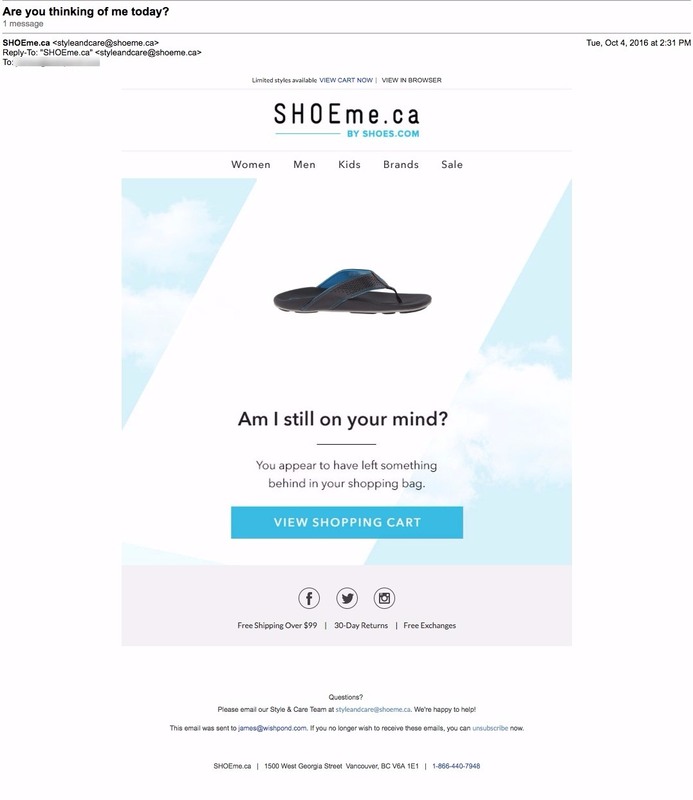 I have a few similar ideas on how you can use our software on AcmeShoes.com as well..
Do you have time this week for a quick call so I can share them with you? The benefit of this, though, is to tailor your product pitch to what they’re interested in, rather than generic, all-platform, sales pitches. When someone abandons your business’ shopping cart without completing a purchase it’s like they’ve finished a marathon but turned to the side right before the finish line. There’s few things in online marketing more frustrating. Luckily, a good shopping cart abandonment email can recover at least a few of them. These people do want your products (otherwise they wouldn’t have put them in their carts in the first place), you just need to give them a little extra push. Offer a limited-time discount or free shipping (often the reason they left their shopping cart in the first place is price). The language “come back to bed” is one of the most appealing phrases out there – either for afternoon delight or because bed is warm and comfortable and getting out of it is usually the worst decision of the day. This is an awesome headline for a bedding and linens company. “You left something behind” implies you didn’t mean to, and is another example (alongside the headline) of using language to create a feeling – in this case, guilt – in your email recipient. The customer testimonial at the bottom is as effective here as it would be in a landing page. My only concern is the “read more reviews” CTA which is equally emphasized as the “return to cart” CTA – which should be the single focus of this email. I’d recommend de-emphasizing a link to a non-optimized page. Clean and with excellent whitespace, Ralph Lauren’s shopping cart abandonment email has a large headline “Forget something?” which captures attention very effectively. “You Might Also Like” is an excellent strategy to drive them back to your site even if not to complete their existing cart purchase. Just be sure you’re recommending things they’d actually be interested in. 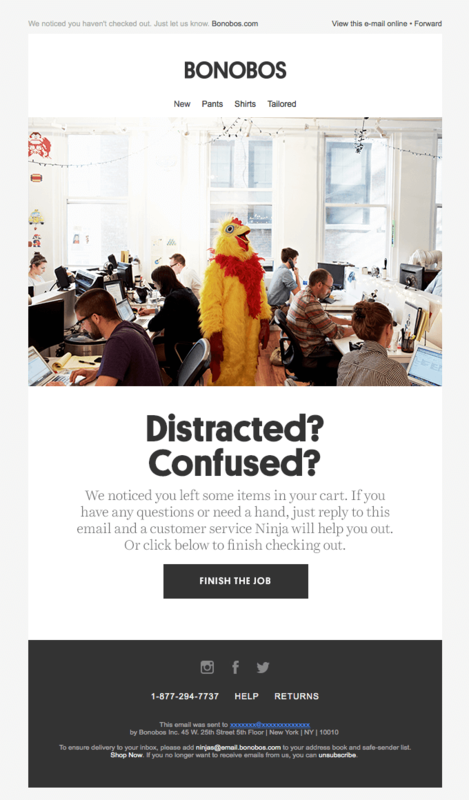 There’s not much more eye-grabbing than a yellow chicken standing in the middle of an office looking confused. With an image like that, you can be sure I’m reading the rest of this email’s copy. “Finish the Job” is an excellent CTA. It inspires action, and no one likes to leave a job unfinished. 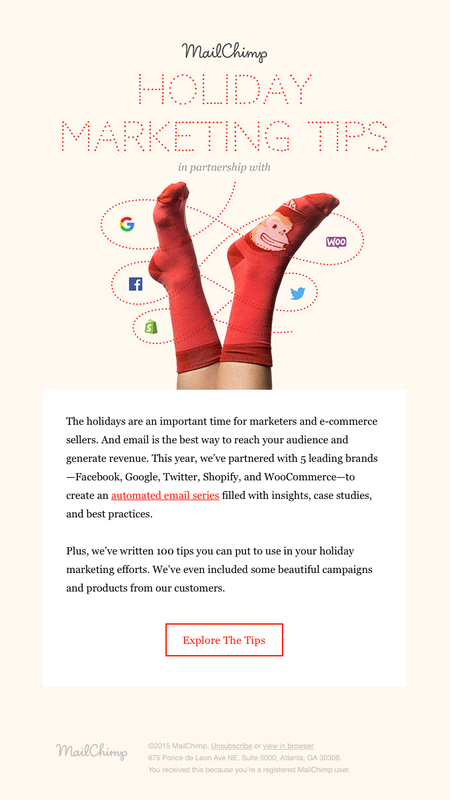 This email puts the product front and center, which makes sense. Nothing is more desirable than the thing your prospective customer already chose. They’ll also recognize it, which will grab their eye. “You appear to have left something behind” is a great way to take the pressure off (it’s not your fault), but no one wants to be left behind or be responsible for leaving something behind. This messaging pulls at our emotions. Large CTA button could be tested with a different color background or a more sales-oriented copy. This email is actually the first of three, all of them with similar messaging and the forgotten product at the center. 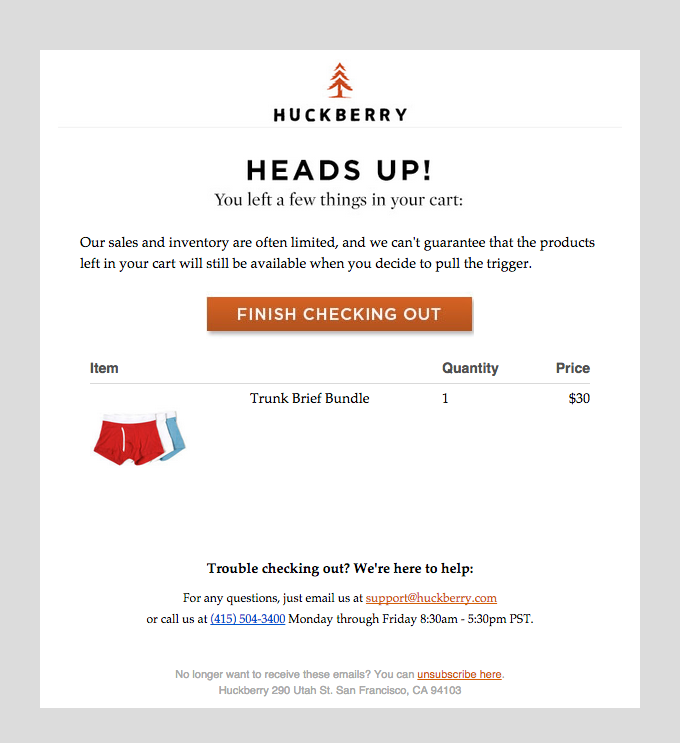 Huckberry puts a lot of stock in creating urgency with limited stock: “We can’t guarantee that the products left in your cart will still be available…” This is actually really effective, especially for smaller businesses where prospective customers will actually believe you might be low in stock. If you’re Walmart, this strategy won’t work. This is a very simple and very focused email, which is good. There’s no below-the-fold so they only need one CTA. There’s only one real link, and it’s large. 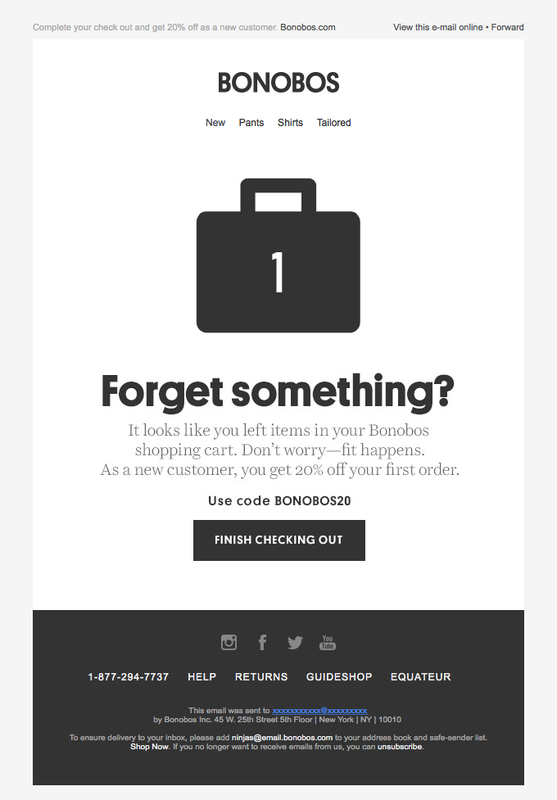 Bonobos gives a 20% discount, but only to new customers (which is a great way to limit the number of large discounts you’re giving). This is an excellent strategy as it’s far cheaper and easier to get an existing customer to return than it is to get the first purchase – well worth a 20% discount. Brooklinen knows that the #1 reason for abandoned shopping carts is unexpected fees like shipping and handling. Making it clear that they won’t have to pay it is a great strategy to send prospective customers back to their shopping cart. The CTA copy “activate free shipping” is super effective because it puts them in control. Essentially this email says “we’d be happy to give you free shipping, but it’s up to you to activate it.” Essentially you’re choosing not to accept free shipping if you don’t click through. “Before your items are all sold out” is also an effective way to communicate a need for urgency. “This coupon is valid for 3 days” incentivizes purchasing now. 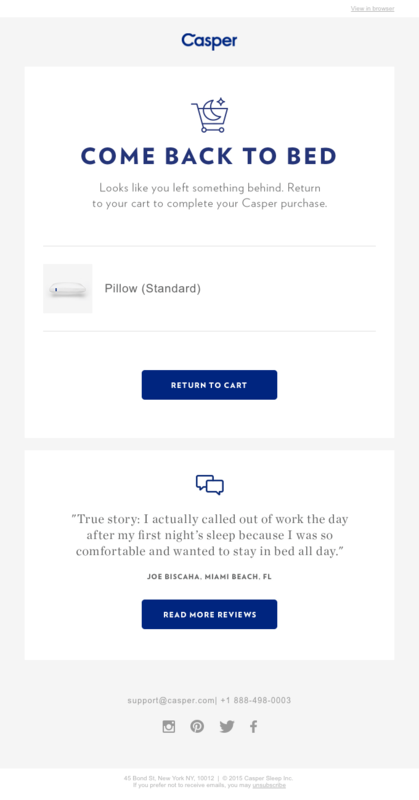 Multiple CTA buttons which would drive the recipient back to the same place (their cart) to complete purchase. “But they’ll disappear soon” creates urgency. Again, this discount is only applicable to the first purchase, but is a pretty serious one. But getting the first purchase is worth a far larger discount than this because of repeat business and the lifetime customer value. The average webinar attendance rate is 40 – 50% of registrants. And between 20% and 40% of those webinar attendees turned into qualified leads. 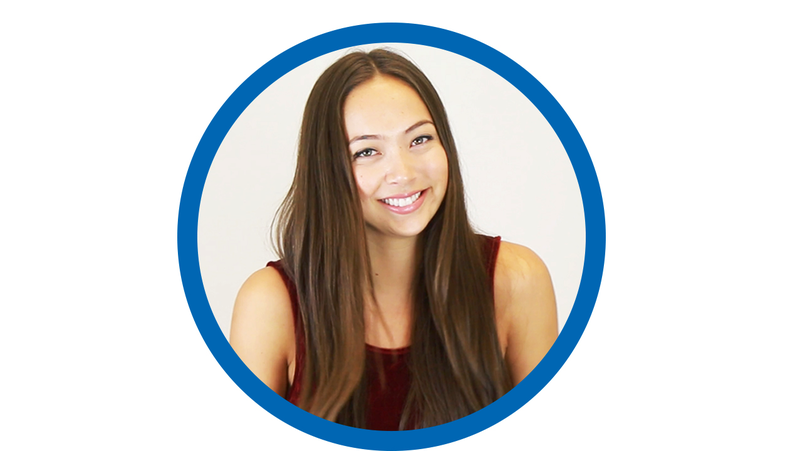 My name is Bree Nakatani and I’ll be hosting the webinar and answering any questions you have. And I do want you to ask questions! We’ll have a Q&A session for at least 15 minutes at the end of the webinar. Please submit them to me directly at bree-nakatani@wishpond.com. I’m sure other marketers like you would love to hear the answers as well but don’t bank on your question being asked! Click here to add this webinar to your Google Calendar. Look forward to seeing you there, and watch out for the giveaway I’ll be doing towards the end! The headshot puts a face to the name and helps to create a personal relationship, which makes it harder for people to cancel their registration or not attend. It’s way easier to bail on someone you don’t know. The request for a submittal of Q&A questions both makes the webinar more engaging and ensures that anyone who’s submitting will attend to have their question answered. Teasing the registrants and email recipients with an unnamed giveaway is also a great way to increase attendance (even if that giveaway is a discount on a first month of your platform or service). This is a reminder that my upcoming webinar, “Optimize Your Landing Page for SEO & Conversions,” will be going live at 11:30 EST tomorrow! Be sure to stick around for the special discount code and your choice of 5 free stock images we’ll be giving attendees! We’ll get rolling at 11:30 EST prompt. Before joining, be sure to check system requirements to avoid any connection issues. And I’m still accepting your questions to bree.nakatani@wishpond.com. We’ve got a few awesome questions in already but to be sure I answer yours, get it in before the deadline! This email’s primary CTA is for recipients to add the webinar as a Google Calendar alert. Doing this takes the onus off you (the webinar host) to remind them. They’ve now committed to the webinar – it’s in their weekly calendar. This email gives a little more information about what the giveaway is, without saying specifically. Keeping it as a tease is a great way to ensure people both show up (to find out) and open your next email. Having a separate page with webinar system requirements (often your webinar client will actually have a page like this you can link to) will save you a lot of technical drama down the line. Prompt question submittal one more time here and use “get it in before the deadline” to communicate urgency. This is a reminder that “Optimize Your Landing Page for SEO & Conversions” will begin in 1 Hour! Click the link below to join the webinar any time between now and 11:30 EST. The webinar will start automatically at 11:30 promptly. I’m excited and ready to go. Let’s get rolling! See you in a sec! The 1-hour reminder email doesn’t need to be long or involved. Keep it tight and focused on the access link. Show the host’s headshot one more time and be sure to keep it personal and friendly. This is when you want to communicate the idea that bailing would be a personal thing. Like any lead generation strategy, unless you have a strategy in place to turn leads into sales, there’s no point in spending a single minute or dollar in the first place. A post-webinar drip email campaign is the best strategy to turn both registrants and attendees into sales. But (as you know) not all leads are created equally. Create a couple drips, one for people who attended, and one for people who didn’t. Of course your webinar attendees will be farther down your sales funnel – they’ll have heard the sales pitch you had in your webinar and will have a closer relationship with your host, your content, and how your platform or service can address their needs. Those who didn’t attend will need a lot more nurturing. Try to get them on another webinar (because you know they like them) before doing a sales pitch. With primarily-educational webinars, a webinar registrant who didn’t show is no better than an email address you found on the ground. Great having you with us for the webinar yesterday. I hope you got as much value out of it as I had fun doing it! We had a lot of great questions in the Q&A at the end. Did you stick around? Did I answer your question? If you have a follow-up I didn’t get to, feel free to respond to this email and I’ll give it my best shot. As I mentioned yesterday, I’m excited to offer all our webinar attendees 20% off a Wishpond monthly subscription. That’ll give you access to popups, landing pages, forms, social promotions, email marketing and all our integrations. Remember how I mentioned that business with more than 5 landing pages generate more than 10x as many leads as businesses with none? 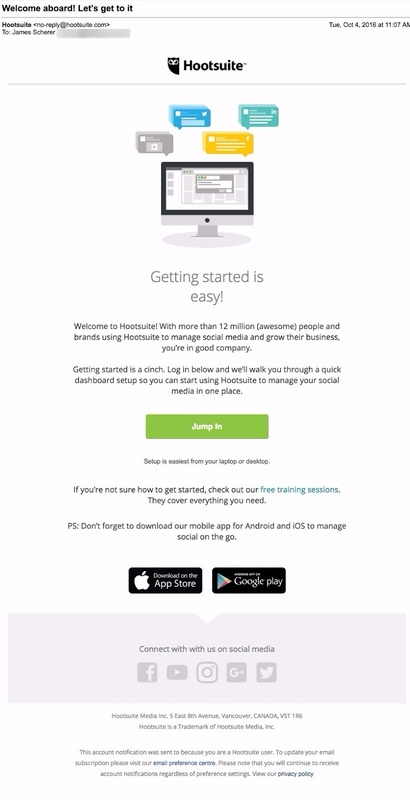 Click here to get 20% off your first month of Wishpond’s lead generation tools. This discount is only available to this webinar’s attendees, and will expire in 3 days. Thanks again for coming along and i hope you learned a bunch. Much love! P.S. If you have any questions about Wishpond’s tools I’d love to jump on a call whenever works best for you. Reply to this email and we’ll find a time. Put your pitch in the context of the webinar’s content. Use phrases like “As mentioned yesterday,” “You might remember,” And “As I said.” This makes people feel included. Emphasize the exclusivity of your post-webinar offer. Make it clear this is only available for a limited time and only available to attendees. Registrants aren’t getting it. The general public isn’t getting it. This is special. Prompt a conversation with a P.S. as well as a “reply to this email for any reason” CTA. Webinar attendees are some of the most valuable customers you can get (they’re usually super engaged once they convert), so they’re worth talking to. We’re sorry you weren’t able to attend our webinar. You can watch the recording and let us know if you have any questions! Thanks for your interest despite being unable to attend. We’re running another webinar on How to Maximize your Website’s Lead Generation with Overlays and Popups in a couple weeks. I’ll be running two back-to-back, the first at 12:30 EST on Thursday the 3rd of November and the second at 1:30, if that’s a better time for you. 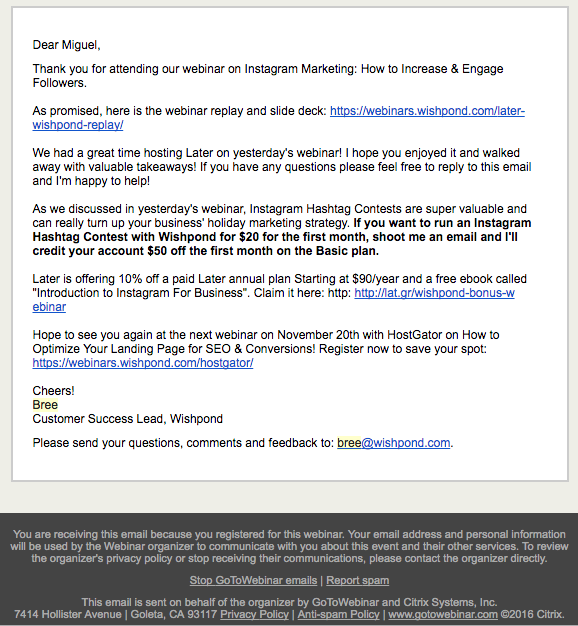 The focus of a follow-up email for someone who didn’t attend your webinar is to get them on another one. You know they’re interested in this kind of content, and you know that a webinar is the best way to effectively but subtly introduce them to your business and how it can help them. Thought I’d reach out to see if you’d had any time to take a look at Wishpond. Did you have any questions? Your exclusive, 20%-off discount for attending this week’s webinar will expire in about 24 hours. After that the monthly plan will go back up to $69. A follow-up email, sent two days after the first post-webinar email, should be simple – reminding them of the discount and prompting them to ask any questions they have. Letting them know about the limited-time availability and putting the value in concrete terms is also a great way to incentivize a response or a signup. After a conference or meetup, take all the business cards you got and, even before going to bed, write down some notes about each person. What did they look like? What was the primary thing you talked about? Were they pitching or being pitched? If pitched, did they seem particularly interested in one part of your sales pitch or another? Everything you can think of. it’ll be clearer now than in the morning and anything will help. The most important question is this one, though: “What are you most frustrated by, in terms of [industry]?” The answers to this question will help you massively when you start turning the conversation towards a sale. In the morning, take all your business cards and add them to your CRM as leads. 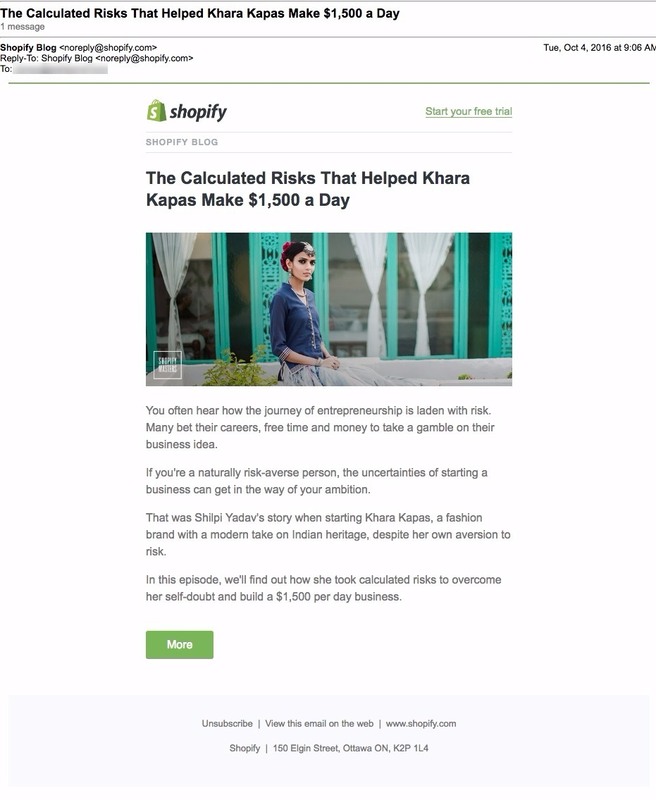 Here are the email templates you can use to nurture them into sales. Early and late-stage lead nurturing is done firstly with education, then with sales. Post-event lead nurturing is no different. This email is all about providing value to your lead. The personalization aspect of this email is also essential. Be sure they know that they’re not being dripped (automatically, at least) with name or brand-dropping. The last thing you want is for them to think they’re being shunted into a workflow. Offering a tool or strategy recommendation is a universally-valuable piece of information appealing to anyone in your target market. This is why many businesses create large tool-based lists posts. They’re ToFu content, sure, but they’re super valuable and everyone loves them. Again, this is an educational email, sent if you get no personal response from the first one. If you do, of course everything will have to be based around that response. That said, a valuable piece of content (created by a third-party, non-competitor), is an excellent second give. Find a way to work in the offer with a personal touch (like “I remember you saying you’re looking to revamp/get into/start”) – this is where your notes come in handy. The CTA for these emails shouldn’t be “Download this ebook” but rather “Happy to discuss if you’re available.” Keep the conversation from the conference going. Glad you found value in the ebook I sent through. I keep that one on my desktop and refer back to it for content marketing article ideas and grammatical stuff constantly. Thanks for referring me to the Groove blog. I’d actually checked them out a year or so go and loved them but forgot all about it. Good to know they’re still pumping out amazing content! For the past six months or so we used our own Wishpond exit and scroll popups to increase the return we were getting from Google Adwords by about 23%. We added them to our campaign-specific landing pages and it’s resulted in almost $20,000 in improved revenue this month alone. You might recognize some of this from a late-stage template above. Essentially it’s the same, except we’ve added some personal touches (when you can re-use content, always do so). Tie it to a frustration they had (that’s why I said “what is a frustration you have?” is the most important question you can ask at a conference). A case study is a great way to promote your business without sounding like a salesperson. It’s not biased if it’s just fact. It’s not “salesy” if the numbers are concrete and can’t be argued against. Just be sure you present your sales pitch at the right time. Use your sales intuition for that. The buried email is, in my opinion, the most important email in this entire resource. Subject Line: Did I get lost? Just want to follow up in case this email got buried. You might be surprised at the results you see. 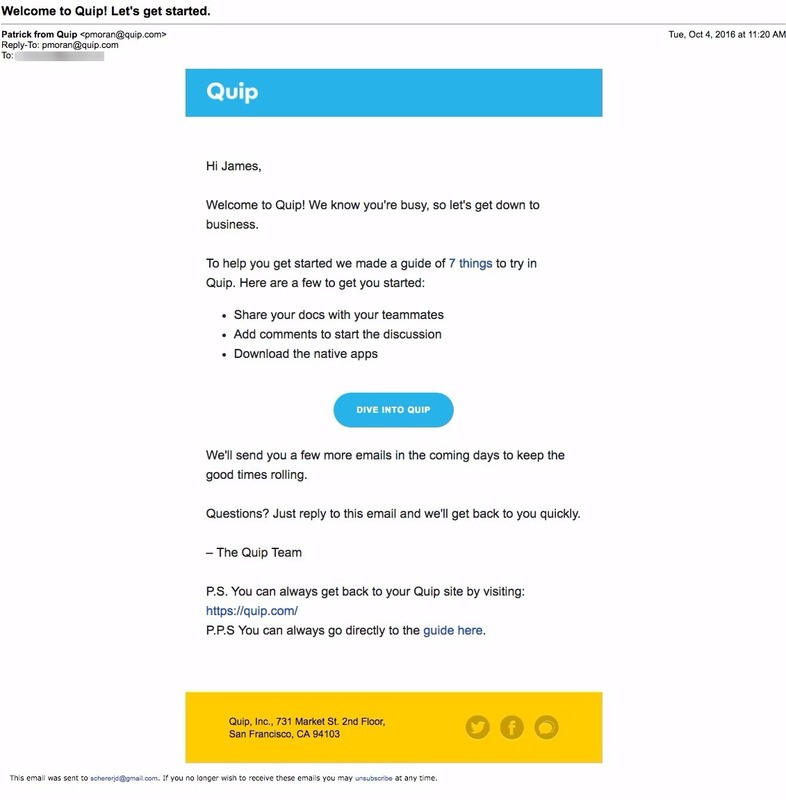 These 40 lead nurturing email drip campaign examples will hopefully give you all the inspiration you need to turn your leads into qualified, interested contacts ready to talk, and customers ready to return again and again. Click below to download the most comprehensive collection of lead generation strategies and examples ever compiled. Completely free.